The Dutch expedition climber Hans van der Meulen is currently the only Dutchman to have climbed five peaks above 8000. 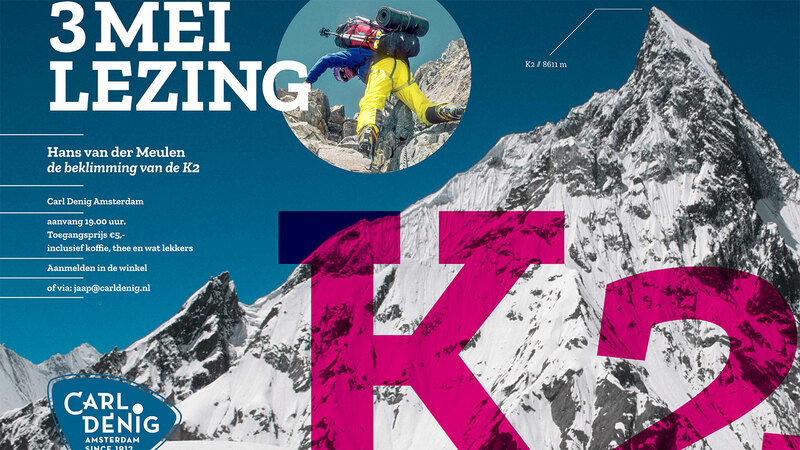 On 3th of May Hans van der Meulen will give a lecture at Carl Denig in Amsterdam about his climb of the 8611 meter high K2, according to climbers the Holy Grail and the most dangerous summit in the world. The lecture – with the appropriate name ‘Crawling to the top’ – starts at 7 p.m. and attending costs € 5. That includes coffee, tea and some goodies. To register for this lecture pop in to the store or send an email to: jaap@carldenig.nl.